Fortunately the majority of patients suffering with temporomandibular joint disorders (TMD) can experience quick relief once they are properly diagnosed and an appropriate plan of treatment is outlined. Most patients will not require surgery or thousands of dollars in treatment expense in order to gain satisfactory levels of comfort and function. Dr. Moodt uses a variety of different types of oral appliances depending upon a patient’s specific condition and diagnosis. Each patient presents with his own unique condition and deserves, therefore, a unique and personalized approach to therapy. The bite splints or othotics are fabricated to provide a custom fit to each and every patient. Dental impressions are obtained and a professional laboratory fabricated acrylic orthotic appliance is custom fitted during a chair side appointment with Dr. Moodt. The appliances are clear, light weight and inconspicuous. Most patients will initially wear the appliance around the clock. Eventually, the orthotic bite splint will be worn sleeping hours alone on a protective and preventive basis. The typical protocol of treatment will require day and night use of the appliance for approximately six months. Afterward, patients typically wear the appliance sleeping hours alone on a preventive and protective basis. You may be tempted to utilize "do it yourself" mouth guards purchased at your local drugstore. 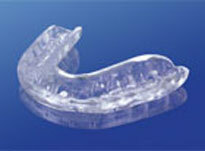 While these bite guards are available most patients report that the "one size fits all" type of mouth guard purchased at the drugstore difficult to wear. Most patients report the appliances to be bulky and impossible to wear during the daytime hours. These bite guards often create excessive gagging, difficult speech and on many occasions even aggravated existing symptoms. While some patients suffering with TMJ disorder will be completely and successfully treated through the efforts of Dr. Moodt and his staff alone, other patients may present with a more complex physical or medical condition requiring a team effort. Successful long term management of chronic pain and temporomandibular joint disorders may require a team effort involving not only Dr. Moodt and his staff but referral to other health care professionals. When indicated Dr. Moodt will not hesitate to refer a patient for additional consultation to ENT, neurology, general medicine, oral surgery, rheumatology, physical therapy, massotherapy, etc. At your first visit for examination and consultation Dr. Moodt will personally review your written health history and discuss and obtain your verbal history. A complete and thorough physical examination of the muscles of mastication, dental occlusion (bite) and temporomandibular joints will follow. Dr. Moodt will review past and present medical history, medications and any history of trauma. Upon completion of the physical examination Dr. Moodt will present you with a clear and understandable diagnosis presented in a non technical fashion. The treatment plan will be outlined permitting the patient to take the first step at eliminating pain, restoring normal function and improving quality of life! Insurance coverage for the management of TMJ disorders varies greatly from one insurance company to another. We encourage you to contact your insurance carrier or read your dental and medical insurance benefits booklets to learn more about whether or not you may have coverage for conservative management of TMD. Our staff will be happy to assist you on that issue also. We do accept MC, VISA, American Express and Discover cards. We offer interest free payment plans for therapy.